As if not troubled enough, Iraq, the country raped by the United States and Britain, is on the verge of complete mayhem once again as Iraqi security forces withdraw control from regions deemed too violent. As violence intensifies to new record levels, the fear is that the Iraqi military and police will unable to handle the carnage and then withdraw, and undo ‘progress’ made after the US military officially left in 2011. Of course, calling it ‘progress’ depends on whether you supported the baseless Western invasion of Iraq or not. And herein lays the problem: will the US invade Iraq once more? Indeed President Obama cannot be more pressured with the Iraq question than today. In the previous weeks the question was whether the US military should be involved in Iraq once more. But as of press time, it was decided to send military advisers to Iraq and Special Forces to help curb the new wave of mayhem. As the Al-Qaeda leftover Islamic State of Iraq and the Levant (ISIL) militant group overpowers Iraqi security forces in more and more regions, some of the greatest offenders of the 2003 invasion of Iraq, which include former British Prime Minister Tony Blair, have lashed out the moderates for not doing enough to curb the new wave of ultra-violence. Mr. Blair also had the nerve to call claims contrary to his as ‘bizarre’ and instead blamed the current upsurge in violence to the West’s failure to act in Syria. “It is a bizarre reading of the cauldron that is the Middle East today, to claim that but for the removal of Saddam, we would not have a crisis,” in a statement on his website. Being among the original fear-mongering Western leaders on the invasion of Iraq in 2003, Mr. Blair still hasn’t changed his stance and strategy regarding ‘inaction’ in Syria, saying If we don’t deal with the Syria issue then the problems are not just going to be for Syria and for the region, the problems are actually going to come back and they are going to hit us very directly even in our own country.” You could replace Syria with Iraq easily and it becomes a statement sounding it was 2003. Riding on a platform of rejection of the war in Iraq during his first presidency, President Obama now is faced with a decision on how to invade Iraq once more. So far, the options include sending ‘advisers’ into Iraq and carrying out a new wave of airstrikes, Operation Desert Fox style with the sending of the aircraft carrier George H.W. Bush to the Gulf. On the other hand, hawks in the US government establishment are blaming Obama for creating a ‘security vacuum’ by unnecessarily pulling out US troops back in 2011. What unites the Western elites though is the belief in a ‘spillover’ of the Syrian civil war into, of all places, Iraq. 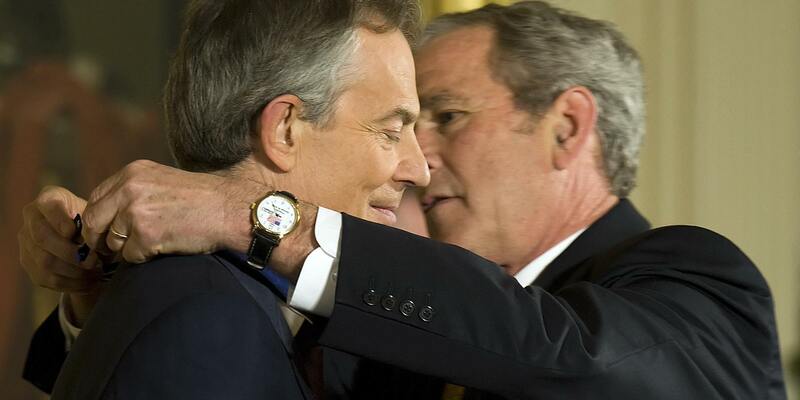 What remains true today are the facts: the lies that initiated the US-UK war against Iraq, the destruction of Iraq society, millions of lives and resources lost, the divide-and-rule strategy that paved the way for sectarian and civil war, all leading to the utter destruction of Iraq.